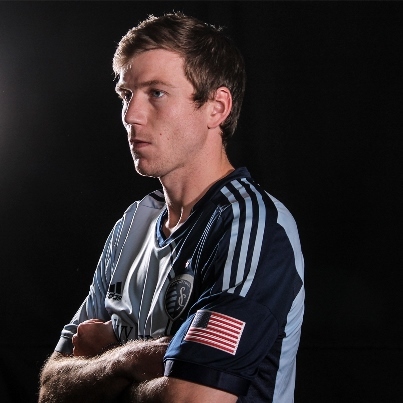 Sporting KC sits atop league with 2-0 win over Crew – Welcome to Wyandotte Daily! Sporting Kansas City re-claimed a share of first place in the Eastern Conference on Sunday with a 2-0 victory over the Columbus Crew at Sporting Park in Kansas City, Kan.
Jacob Peterson and Claudio Bieler scored their first goals of 2014 while Eric Kronberg made four saves for his fourth shutout of the season, most among MLS goalkeepers. Sporting Kansas City remains unbeaten at Sporting Park in its last 11 games in all competition dating back to 2013, highlighted by the team’s MLS Cup triumph over Real Salt Lake. Prior to Sunday’s match, Sporting Kansas City players, coaches and staff were formally presented with their championship rings in a special pre-game ceremony held on the field. Peterson, making his second league start of the year and first since the regular season opener, struck for the game-winning goal in the 10th minute. Chance Myers’ cross from the right flank connected with Paulo Nagamura, whose first-time shot was blocked by Giancarlo Gonzalez but eventually fell to Peterson following a deflection off Michael Parkhurst. A nine-year MLS veteran, Peterson made no mistake in a side volley from 10 yards out for his 14th career MLS goal and first since the final game of the 2012 regular season. Kronberg made his first of four saves, and the match’s best, in the 31st minute on the Crew’s only shot on goal of the opening 45 minutes. Bernardo Anor rose high to re-direct a well-struck service from Wil Trapp, but Kronberg reacted quickly make a one-handed stop low to his right to stop the header on the goalline. Seth Sinovic nearly doubled Sporting Kansas City’s lead three minutes later, settling a pass from Oriol Rosell behind the Crew backline and forcing a kick save from Crew goalkeeper Steve Clark. Dom Dwyer led all players on Sunday with four shots, coming close in the 49th and 66th minutes on the receiving end of Graham Zusi crosses. Kronberg made three important saves in a seven-minute span during the second half to preserve the clean sheet. In the 58th minute, he dove to his left to hold a curling effort from Anor and followed that with an extension effort to his right to deny Federico Higuain five minutes later. His final save of the day came in the 65th minute, again on Anor as he pushed away the attempt from 30 yards out. The rebound fell to Jairo Arrieta from point blank range and that too was turned away by Kronberg, though the Costa Rican was ruled to be in an offside position. After Sunday’s shutout, Sporting Kansas City has allowed only one goal at home in six matches in all competition in 2014 and lowered the team’s league-leading goals against average to 0.75 per game. 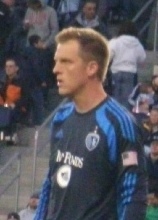 Bieler would eventually put the game out of reach in second-half stoppage time, the culmination of Sporting Kansas City’s offense creating continued chances during the game’s late stages. Feilhaber went forward with an individual effort in the 72nd minute, forcing a turnover and firing a shot from the top of the penalty area that carried narrowly wide. The Crew were left shorthanded for the final 10 minutes upon Trapp being shown his second caution in the 80th minute for bringing down Feilhaber in the final third of the field. Sporting Kansas City quickly capitalized on the man-advantage, testing Clark with shots from Dwyer in the 83rd minute and rookie Alex Martinez in the 88th. 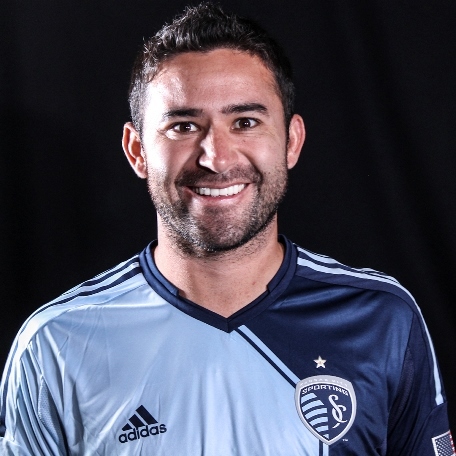 Bieler, the beneficiary of a pinpoint chip from Zusi, put the final touch on the 2-0 victory in the 95th minute with the fourth latest goal scored in regulation in the team’s 18-year history. Soony Saad, making his 2014 debut, won the ball from Parkhurst to start the scoring sequence and Zusi made the key play with a first-time, left-footed chip over the outrushing Clark. Bieler calmly slotted his shot into the empty net for his first goal of the campaign after leading the team in scoring in 2013. With the assist, Zusi moves into a tie with Davy Arnaud for third most in club history with 35 assists in the regular season. The U.S. Men’s National Team starter has now played a part in 56 goals (17 goals, 39 assists) in MLS competition since the start of the 2011 season, sixth most among MLS players. Attendance at Sunday afternoon’s match was 20,565, and the temperature was 81 degrees. Sporting Kansas City will next travel to Montreal to take on the Impact (1-4-3, 6 pts) at 3 p.m. on Saturday, live locally on KMCI 38 the spot and across the Midwest on SKCTV.